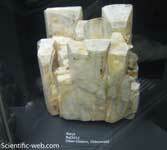 Baryte (BaSO4) is a mineral consisting of barium sulfate. It is generally white or colorless, and is the main source of barium. Barite is the unofficial American spelling. The mineral is also called heavy spar or tiff. The radiating form, sometimes referred to as Bologna Stone, attained some notoriety among alchemists for the phosphorescent specimens found in the 1600s near Bologna by Vincenzo Cascariolo. Its Mohs hardness is 3, the refractive index is 1.63 and it has a specific gravity of 4.3-5. Its crystal structure is orthorhombic. The name baryte is derived from the Greek word βαρύς (heavy). In commerce, the mineral is sometimes referred to as "barytes." When the International Mineralogical Association formed in 1959 the American spelling "barite" was chosen as the official over the older "baryte". This decision was reversed in 1978. The term "primary baryte" refers to the first marketable product, which includes crude baryte (run of mine) and the products of simple beneficiation methods, such as washing, jigging, heavy media separation, tabling, flotation, and magnetic separation. Most crude baryte requires some upgrading to minimum purity or density. Baryte that is used as an aggregate in a "heavy" cement is crushed and screened to a uniform size. Most baryte is ground to a small, uniform size before it is used as a filler or extender, an addition to industrial products, or a weighting agent in petroleum well drilling mud. Some 77% worldwide is used as a weighting agent for drilling fluids in oil and gas exploration. Other uses are in added-value applications which include the car, electronics, TV screen, rubber, and glass ceramics and paint industry, radiation shielding and medical applications (barium meals). Baryte is supplied in a variety of forms and the price depends on the amount of processing; filler applications commanding higher prices following intense physical processing by grinding and micronising, and there are further premiums for whiteness and brightness and colour. Baryte is used in the manufacture of paints and paper. Although baryte contains a "heavy" metal (barium), it is not considered to be a toxic chemical by most governments because of its extreme insolubility.